This is one of my quick and easy one-pot dish. I think you don’t need to be a cook to do this. It is that simple. Do not do away with the browned garlic and Chinese celery as it really improves the flavour. I also think it is worth the few minutes of browning your own garlic. Store bought ones are just not the same. Stock – this is why I say it is useful to have ready stock on-hand. Green, leafy vegetable, any kind. E.g. Kangkong, xiao baicai (???). Trimmed and washed clean. 1. Boil a pot of hot water and put in the Yong Tau F00 items to boil for a few minutes. 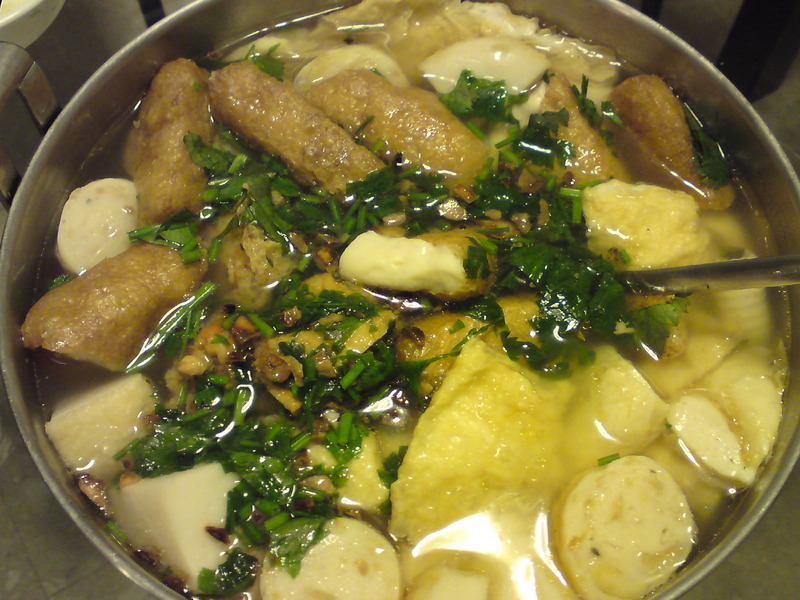 For items such as fishball or fishcake, boil until they float to the surface of the water. Remove from pot and set aside. Do this by batch. Start with the non-fried items (such as un-fried fishball) and end with the pre-fried items (such as tau pok). The purpose of this is to remove most of the oil and MSG off the items, so it is not advisable to start off with the pre-fried items as your water will become very oily and your non-fried items will end up being cooked in oil. You really don’t want that. 2. If you wish, you may want to cut some of the items into smaller pieces. 3. Heat up some oil in a small frying pan. Fry the chopped garlic until light brown and fragrant. Drain from the oil and set aside. Garlic burns very fast so do take care and not over-fry. 4. Bring a pot of stock to boil. Add all your Yong Tau Foo items back into the stock and boil for a while more. About 5 minutes. Season to taste. As the Yong Tau Foo items are already flavoured with MSG (unfortunately) and salt, I find that it usually takes very little seasoning to season the stock. Take care you do not overdo it. If you use packaged store bought stock, you may not even need to season at all. 5. Add in your leafy greens and continue cooking until the vegetables are cooked. This should not take more than a few minutes. Do not overcook your vegetables. 6. Garnish with browned garlic and Chinese celery before serving. We usually have this with rice but noodles will do just as well.